Fortunately there is still a way you can make use of YouTube playlists in your JW Player setup. 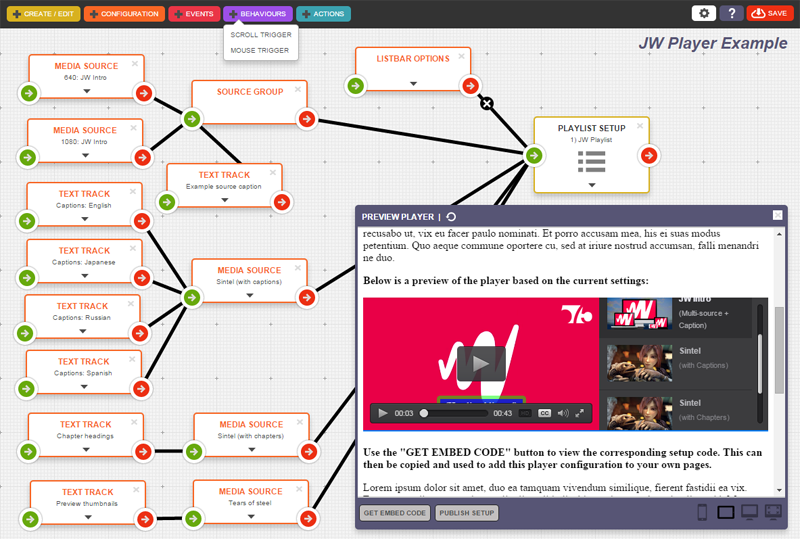 Tubey is a JW Player plugin which, with a slight tweak to your configuration, will allow you to continue to load the full YouTube playlist. It also provides the ability to merge multiple YouTube playlists into one. Chiki is an accessibility aid for web users who primarily use a keyboard to navigate sites – it’s basically “Skip Links” with attitude! One of Chiki’s aims is to rationalise the document outline of a web page and present it in a consistent way using a traditional semantic structure – regardless of the underlying code quality or markup used. It also highlights Landmark Areas within the page and provides the means to jump directly to these areas. When it comes to Page Links, Chiki will remove duplicates from the same Landmark Area whilst standardising the link text across various screen readers. Allows you to Promote certain Links so they appear first in the tab order. Exposes the page tabbing order for sighted keyboard users who are attempting to navigate without a mouse. Allows you to override the behaviour of Links which are coded to automatically open in a new window. Provides the means to access Footer navigation links which are on “endlessly scrolling” pages. For web site owners, Chiki is a great way to visually sense check the tab order and associated link texts that a keyboard/screen reader user will experience. One really useful feature of Chiki is the ability to Promote Links. Using a simple configuration field you are able to specify word combinations which, if found in the text of a Page Link, will promote that link to a special section within the Chiki Link Panel – at the top of the tab order. This makes it easier to find links that are important to you. The default action when selecting a Chiki Link will be to focus you at the relevant point within the underlying web page – whether it’s a Landmark Area, Page Heading or Page Link. For an example of how a bad accessibility experience can be improved using Chiki, try loading Chiki as a bookmarklet on next.co.uk. Obviously when loading Chiki as a Bookmarklet it will only exist temporarily for the page it is manually loaded on – when you change page, you will need to reload the Bookmarklet. The real value of Chiki comes when it is loaded site-wide. Once the Chiki library has been added in this way, you can customise the colours used, along with the text displayed in the dialog footer and the default terms included in the Promote Links configuration field. By downloading and enabling this Chiki Chrome extension, you can have Chiki automatically load for any web page that you visit. Any comments, thoughts or suggestions regarding Chiki would be welcome. You can contact me @jherrieven on twitter.